It's been a strange year for JRPG fans. On one hand, the genre seems to be doing just fine: we finally got our hands on games like Xenoblade and The Last Story, the 3DS and Vita are full of JRPGs, and companies like XSEED and Atlus are cranking out niche Japanese games on a regular basis. On the other hand, it's hard to escape that feeling of gloom as more and more Japanese RPGs are trapped in Japan, never to see American shores, while companies like Square Enix evolve from RPG powerhouses into phone-game factories. So as we head into 2013, let's take a look back at the year in JRPGs. 2012 started off with an odd sort of bang, as we saw a new console Final Fantasy game for the first time in a few years. Well, technically it was new. Final Fantasy XIII-2, a direct sequel to Final Fantasy XIII, felt less like a brand new experience and more like an apology for its predecessor. 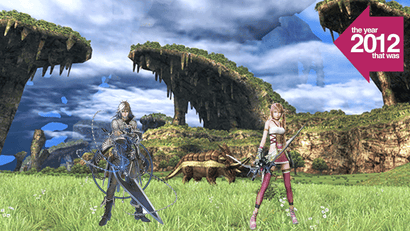 Gone were the straight-line dungeons and townless scenery; FFXIII-2 was packed with sidequests, NPCs, puzzles, and all the other RPG elements that Final Fantasy XIII lacked. I didn't care much for Final Fantasy XIII-2 — the combat was fun, but the characters were seriously grating — which is why I got a little depressed when I looked back through the year and saw that it was Square Enix's only non-portable RPG release of 2012. Sad. Early 2012 brought with it two Tales games, which are basically the fast food of JRPGs. They go down easy, and you always know exactly what you're getting. Sometimes you just get a craving for the sugary, nutritionless goodness of a game like Tales of the Abyss or Tales of Graces F: the cartoony graphics, the button-spam combat, the shrill voice acting. If Abyss is McDonalds, Graces is In-N-Out: high quality fast food, but still fast food. Sadly, 2012 also continued to teach us an unfortunate lesson: Japan hates America. New Suikoden game tops charts in the east? No plans for North America. Lovely Square Enix game that looks like the Final Fantasys of old? No plans for North America. Anime-ish JRPG made by all-star developers? No plans for North America. It's a sad state of affairs, although the continued success of localisation companies like Atlus, XSEED, and Level-5 has made me at least a little more optimistic about the future. And at least we got Xenoblade and The Last Story, two RPG powerhouses that seemed like they'd never leave Japan just a year ago. It's still hard to believe that this year's biggest console RPGs were on the Wii, a console that most gamers probably haven't touched much over the past couple of years, but hey. I enjoyed playing both games, but I thought Xenoblade was dreadfully overrated and that The Last Story was one of the best console JRPGs we've seen in years. Handheld JRPG gaming was also rather impressive in 2012: the PSP saw a ton of strategy-RPG releases like Ragnarok Tactics, Gungnir, and the excellent Growlanser: Wayfarer of Time. Of course there was Persona 4 Golden on the Vita, the game that Kirk and I can't shut up about. Ragnarok Odyssey brought some monster hunting to Sony's newest handheld, and Paper Mario: Sticker Star is an entertaining, if frustrating JRPG-style game for 3DS. So what else came out this year? There were a few Ys games released on Steam, if you're into hacking and slashing. Final Fantasy Dimensions is a fun, if overpriced adventure for iOS, and there were roughly seven thousand JRPG-style games thrown on Kickstarter, some more successful than others. That's 2012 in JRPGs, in a nutshell. It was a good year, I think. Here's to the next one. Yeah, I managed to finish ff13-2, it was slightly better than 13, still pretty terrible overall. But all of squeenixs next-gen JRPG's have been so far. the Vita is full of JRPGS? what the? like what? Persona 4 is the only one that comes to mind. All the PSP games you can re-buy for it I guess? Or in comparison to 3DS, maybe? Plus a ton of Japan-only games like Tales of Innocence R (and Tales of Hearts early next year), Ys IV, Legend of Heroes stuff. Regardless I agree that 'full of JRPGs' isn't really fair though. Come again? It's not just the best JRPG of this year (well, last year here), but I'd say it's the best JRPG of this whole generation. And not once while playing Paper Mario have I ever thought "this has any resemblance at all to a JRPG." Edit: Thinking about it, I have no idea what genre I'd actually class this game as. I'm hesitant to even call it an RPG. Glad to hear people are still rating Xenoblade. I managed to pick up Last Story the other week and I am really enjoying that so far. Ive put off Xenoblade for so long its harder to find a copy. You'll love Xenoblade then! Local retail is always a bit hard but I think it's around $48 new at Ozgameshop. I think it's about $40 pre-owned at EB if you're lucky enough to find a copy. Yep! Sadly I had one copy at my local EB and I put off buying it until Wii U launch - and as you can guess, it was gone. Im sure if I hunt around ill find a copy second hand (EB has 2 stores left with brand new copies) but it will be work. Ah yes, I remember this :), excellent review! I even commented on it way back when. Spot on. And the soundtrack is fantastic! Couldn't agree more, Xenoblade very much deserves its high acclaim. I'll go as far as saying it's the only 'must-play' JRPG for this gen (which is quite sad when you think about it). Does The world ends with you count as "this gen" being on a handheld/phone/tablet? Wow I forgot about that one. I'd count it as "this gen" since it was on the DS which is sort of on the edge of console generations (but was last gen when it comes to portables). The thing for me about Xenoblade being my favourite JRPG this generation is mainly because there honestly wasn't that much. Before it, I had Lost Odyssey and Tales of Vesperia came close. I mainly thought about console JRPGs but there's been some excellent handheld ones. His comments on The Last Story is just... no... Sure, it was okay and certainly enjoyable at times but it's also incredibly flawed and there's plenty of console JRPGs that are better than it. However, Xenoblade trumps them all and is also my pick of BEST JRPG this generation. Don't ask me, I'm not a fan of that D.C. fellow. I'm not angry but it's still an idiotic statement "dreadfully overrated" is way too harsh. I'm siding with "dreadfully overrated". But then, opinions. If you don't mind me asking, what made you think it was "dreadfully overrated"? You tell em Greenius. Xenoblade was frickin awesome! Oh and thanks for Mighty Ape, besides Tales of Graces f I managed to score 3d dot heroes for $20 today!! The fact that he didn't even finish the game before writing his review and giving it the "dreadfully overrated" comment shows that his opinion is invalid. He made quite a number of factual errors in his review that made me wonder whether he went into it thinking "Everyone's raving about this game, but I'll prove them all wrong! Hah! See? I wrote bad things about it!". You don't write a review for a single player game like Xenoblade without finishing the thing. That's the number one sin of game reviewing. Finish the game first, THEN write your review. I mean he only got 30-odd hours into a 100+ hour game! It's okay, @strange has the game now. I enjoyed it (XIII) too but I dunno, I guess it just wasn't as good as the others. The main thing for me was probably the linearity and it felt like there wasn't much to do. The long wait and hype probably killed it for me too and it ultimately left me disappointed. However, being a Final Fantasy fan I was going to get XIII-2 but I wasn't exactly super excited for it. I didn't really read much on it to avoid getting over hyped but I ended up pleasantly surprised. In my opinion it was better than XIII in almost every way. Still had a lot of fun with it and I don't regret purchasing it at all. I do feel like people are giving it and XIII too much crap but some of it is justified. I love XIII, linearity, characters and all. I love XIII-2, just everything in it.